Audrey was born in Tullahoma Tennessee. She attended high school at Collins Hill High School in Suwanee Georgia. She then attended Lipscomb University in Nashville Tennessee where she received a double major in biology and psychology and a minor in chemistry. She completed her Master’sof Science in Physician Assistant Studies at South University in Savannah Georgia. She is a board-certified Physician Assistant. Audrey joined Dr. Bognar’s practice (at that time, Arthritis, Allergy and Asthma Center of Gainesville)in 2006.She followed Dr. Bognar in 2007 to Arthritis Center of North Georgia. In 2010 she completed her post grad training in Rheumatology for Allied Health Professionals. She is also a certified densitometrist, which is a specialist in the study ofosteoporosis. 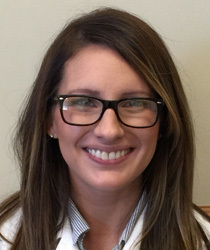 Audrey is a member of Society of Physician Assistants in Rheumatology, Georgia Society of Rheumatology, American College of Rheumatology and the American Academy of Physician Assistants. Copyright © 2019 Arthritis Center of North Georgia. All Rights Reserved. Site Design by Plank Interactive.